Objective: Teach students the impact of the truth in relationship and provide a checklist around integrity as a decision making model for difficult situations while building those relationships. Think of three simple tasks your students can complete with minimal adult supervision and take about one to two minutes to complete. Build a tower on your desk with three blocks and have a few extra blocks available. Have another adult in the classroom prepared to do the tasks with the students. Prepare the second adult by sharing both the tasks and the role of the second adult in the room. Share with the students that you are going to trust them to complete some tasks. Spend a few minutes talking about what trustworthiness looks and sounds like. Show them the trust tower you built. You say that trust is built by showing someone over and over again you are trustworthy, like blocks in a tower, getting taller each time you show that trait. Explain to the students that you will give them the instructions for the first task and then close your eyes because you trust that they will complete the task. Give the instructions for the first task and close your eyes. The second adult in the classroom will do the task with the children. Open your eyes and ask if the task was completed. They will say yes and congratulate them on building trust by adding a block to your trust tower. Give the instructions for the second task and close your eyes. The second adult in the classroom will not do the task and be very over the top and dramatic about so the students see. Take one block off your trust tower. Tell the students when trust is broken it starts to break down the trust tower and the trust in your relationship with another person. Give the instructions for the third task and close your eyes. Again, the second adult in the classroom will not do the task and this time will also encourage other students to not complete the task. Open your eyes and ask if the task was completed. Again, make sure the second adult very loudly says yes. The students may call out the adult and other students (ignore these, as you do not want to call out individual students in a group) who did not complete the task. If not, the second adult should confess, but not point out any individual students who followed along. Take another block off the truth tower and focus on the second adult’s lie. Mention that when one person lies, it often shows other they can get away with it. Sometimes the trust tower falls really quickly when we see others lying and getting away with it. For each answer the students give that show trustworthiness, add a block and talk about the power of the choices they make each day. It’s easy for the tower to break down, but it takes work to build it back up, especially when we watch others around us “get away” with breaking trust. The right and wrong choice is not always as clear as students think it will be. Share an example where you had to make a hard decision where the choice was not easy. Ask students to think about how they would figure out the right thing to do when it was a hard decision and ask them to share ideas. 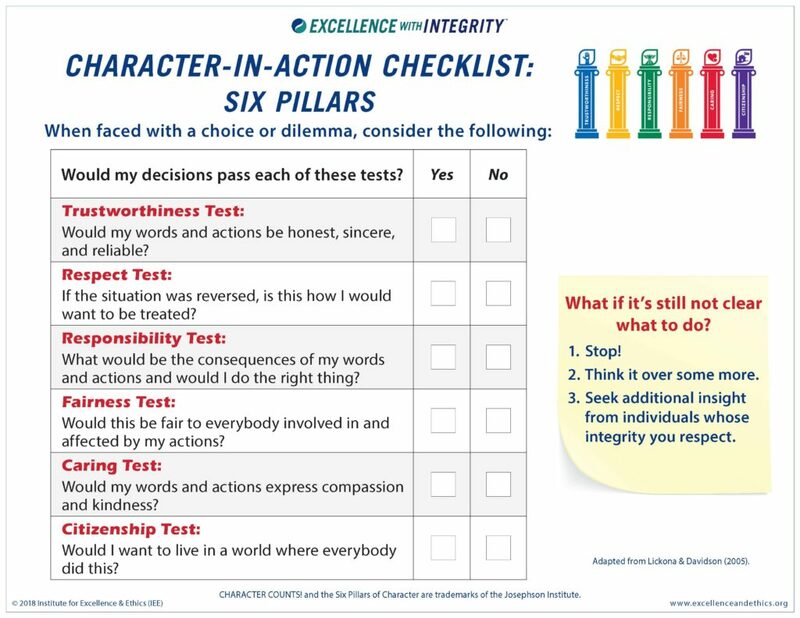 The Character in Action Checklist: Six Pillars consists of nine questions that when applied to a difficult decision can help us determine the right choice to maintain our integrity and trustworthiness, especially as we build relationships like the tower. You may need to spend some time explaining or giving examples, depending on the development level of your students. You may modify to fit appropriately. Practice applying the questions to the hypothetical situations below. Jimmy is at a grocery store where the candy bars are $1.00 each. He purchases one and gives the cashier a five-dollar bill. The cashier is very busy and gives Jimmy $9.00 in change (she thinks Jimmy gave her a ten-dollar bill). What should Jimmy do? You and your best friend Ashley go to a play center. The larger play structure has a sign that says “8 Years and Older Only.” Ashley is still 7 years old but says “who will know?” What do you say to Ashley? Samantha tells you that she did not complete her homework for today and will be grounded by her parents for the missing assignment. If Samantha tells them about the assignment, she’ll be grounded tonight and she will miss a birthday party. If she doesn’t tell them tonight, then they’ll get an email in a few days about the missing assignment. Samantha wants to go to the party and asks what she should do. What do you tell her? Your class is taking a math test when another teacher shows up at the door. Your teacher’s back is turned and in a deep conversation with this other teacher. Your friend Michael is having a hard time in math and is really trying hard for a better grade. He asks if you can him the answer to question number 6. What do you do? As young children development telling the truth can be a difficult skill and there will be slip ups by all children. It’s important that we celebrate telling the truth. Encourage families to create a plan at home for encouraging telling the truth. Create a sticker chart, track with marks on a calendar or collect items in a jar for every truth told. Understanding that even when children make a mistake, that if they respond with the truth that it should be praised. The best way to build is a skill is repetitive practice and praise the behavior you want to see around that skill. Celebrating the successes of truthful moments will help build this crucial character trait.